This helps ensure that the cat you've chosen will fit in well with your household and family. 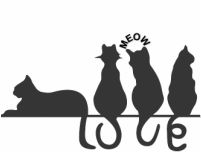 Every cat/kitten adopted through Long Beach Felines is vaccinated, spayed/neutered, dewormed, de-flea'd, tested for Feline Leukemia & FIV and microchipped. We also provide one month of free pet insurance to assist in the transition of your new pet from rescue to residence.